New Delhi: Leaders across the political spectrum paid homage to the victims of the Parliament terror attack on the tenth anniversary of the audacious strike on Tuesday amid calls for speedy execution of the death row convict Afzal Guru. Leader of Lok Sabha Pranab Mukherjee and leaders of opposition in both Houses, Sushma Swaraj and Arun Jaitley were also present on the solemn occasion which brought back chilling memories of the attack on the citadel of democracy. Recalling the 13 December 2001 attack, Advani said, “If even one of them had succeeded in entering Parliament House, it would have been horrific." 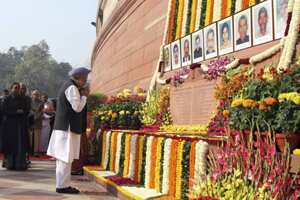 As security personnel saluted the martyrs, parliamentarians stood in silence for a minute. A blood donation camp was also organised on the occasion. BJP spokesperson Ravi Shankar Prasad said, “When the entire legal process has been confirmed by the Supreme Court, why the delay in Afzal Guru’s case. How long? Why? I think, the sooner that verdict is executed, it will be the biggest homage to those great warriors." Afzal is facing death sentence in the Parliament attack case and his mercy petition is pending with President Pratibha Patil. All-India Anti-Terrorist Front (AIATF) chief M S Bitta, who has escaped terrorist strikes in the past, said there should be no delay in execution of Afzal. “Don’t humiliate us...take back the petrol pumps that were given to us, but hang Afzal." he said at an event where children of some of the victims were present. The daughter of Kamlesh Kumari, a woman constable with the CRPF who was gunned down during the attack by LeT and JeM terrorists, echoed similar sentiments and demanded that Afzal be hanged as soon as possible. Besides Kumari, the victims included five Delhi Police personnel, two Parliament watch and ward staff and a gardener. All the five terrorists were shot dead.